November 18, 2006, as a friend’s son and I were doing “touristy crap” in the city and we happened to stumble upon a Big Apple Convention event being held at Penn Plaza Pavilion. The Pavilion was located directly across from Penn Station, where we had just left the LIRR. We paid the $15 cover and walked through the doors and into another reality. As we made our way up and down the aisles, I found myself standing in front of a table which hosted the actors: David Harris (Cochise), Roger Hill (Cyrus), Apache Ramos (Orphan) – from the movie The Warriors (I resisted the urge to ask them if they wanted to come out and plaaaayyyyy). I believe there was a video game or a new graphic coming out that featured their storyline. A little further along the aisle was none other than Adam (freaking) West. Batman. Right there. Arm’s length away from me. Oh, what I would have given to have today’s cell phone technology then. Just past Mr. West was Joyce DeWitt of Three’s Company fame (later years, I always erroneously think it was Cindy Williams – who, oddly enough, is currently on the circuit as a con guest). I scratched my head thinking of DeWitt and tried to understand WTH she was doing at a comic book venue. Booth filler is how I look at those odd guests now – or someone to catch the attention of the parents who had come along for the ride with their teenagers. After ogling the media guests I went to work on combing through the boxes to see what treasures I could unearth. 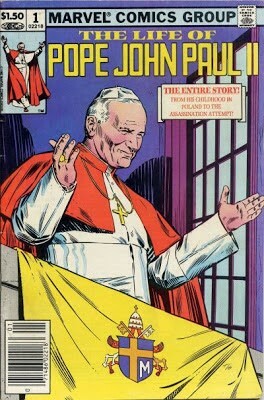 I still have the comic book I bought that day – it featured the Catholic super hero Pope John Paul II (take your judgey glasses off, I see you reading this through tainted lenses). Ok, I bought it as a conversation piece, but still. As I was looking over the book I stepped back and chuckled. It was then that I got caught up in a curtain that was used as a barrier between booths. In trying to untangle my feet, I found myself on the other side of the curtain looking down at a seated hefty Val Kilmer. A loud chuckle escaped my throat as I apologized and he said “hello”. Another chuckle. “Hi.” Then a handler cleared their throat and I noticed the sign asking for $20 to get an autograph from him. Maybe if it was the “Iceman” version of Kilmer, yes. This hunk-to-chunk version would not see my money on this day. To this day I cannot, for the life of me, understand how Kilmer rated the curtained area that cordoned him off from the con-goers while Adam West was out in the stream of the aisles. I would like to think that it was because West was more personable and wanted to actually meet his fan-base. There is something about the camaraderie of the people who understand your love of a “lifestyle” that most do not get. To always read which heroes are coming to the screen or which artist will ink a certain series – it gives me a certain thrill. But when you step out of this “other reality” and back onto the city street with the “normal” people, it is hard to explain your fascination with all things fantasy. But you know, this was back before The Big Bang and geek-chic attire. This was when you had to go to a convention or comic book store to find that cool shirt (and pay a decent price due to supply vs demand). However, as I think back to my first time walking through that arena of all things awesome, I think that it was a more pure experience of being a nerd. Now, well… whoda thought it would become a fashion trend? I still love it though. Geek to the core. So, tell me about YOUR first time….